It’s kind of funny how life gain abilities are. They’re generally not good enough . . . unless they’re massively dominating. I’m thinking of Martyr of Sands, which the Archfiend here is not really fast enough to stop, and Oloro, Ageless Ascetic – which he is in a much better position to deal with. This guy seems tailor-made for Commander settings, where he has “tribal” support in the form of Kaalia of the Vast. Of course, a lot of people will probably see you as a threat, but you might be able to convince them to leverage his ability against a third player . . .
Archfiend of Despair is a combination of Everlasting Torment, Wound Reflection, and a big angry flier. Although it doesn’t scream “Battlebond” this demon is nice in multiplayer. This card is a bit deceptive as he doesn’t have to be in play when the damage is dealt. Deal 10 damage to someone in a single turn then drop this guy for a huge win. You’ll definitely want to run a copy of Blood Tribute in single player or Havoc festival in multiplayer. His 6 power is also misleading since in a vacuum he can deal a massive 12 damage a turn. Archfiend is also a “nice” demon since he has no drawbacks. Your life can still go up as your oppoent’s goes down. For the sake of nit picking, this card’s ability doesn’t multiply the damage so there’s no Infect or Commander damage shenanigans. The biggest problem with this card is that it is too slow in competitive formats. This point is moot as it isn’t legal in most. There’s this obscure card called Cabal Coffers that can get Archfiend of Despair out early on the curve. So get out there and flay your opponents. Have fun. Talk about despair. 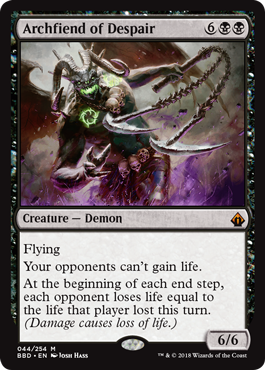 Archfiend of Despair is Wound Reflection stapled to a body…in this case, 2 more mana gets you a 6/6 with flying and blocks their life gain effects. While dedicated life gain is unlikely to ever be a good strategy, there are a lot of incidental life gain effects in Magic, ranging from lifelink to even things like life gain riders on spells. Make no mistake, eight mana is expensive, and Archfiend of Despair lacks much in the way of protection outside of that 6 toughness. With that said, it is an eight mana creature that can win you the game that turn, and one that can scale viciously into games with more people. This won’t make it in Legacy (Battlebond is neither legal in Standard nor Modern), but it’s scary everywhere else, since life loss is almost as common as life gain (and this triggers every end step! ).